Adaptable in headband width, to adjust to varying need based on the user's preference. 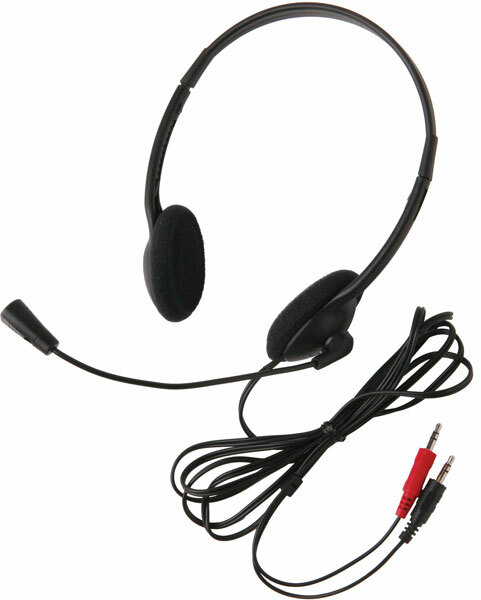 Use this light weight headset in different learning and interactive sessions, such as a recorded teacher lecture, and as a language learning aid. Functioning as a device that is easy to move around with, makes it an ideal choice in making presentations as well. The attached, flexible boom mike can easily be moved out of the way, so that one can use the headset for an uninterrupted listening experience. Comes with ear cushions for added comfort and protection. The permanently attached cord with reinforced connection prevents accidental pull out in class rooms. Extended 3.5mm 6' cord with mini plugs connect to commonly used media players.